Sricure's hair care product which have essential properties to treat hair problems like thinning of hair and dry or flaky scalp.They are used not only for moisturizing purposes but also to promote hair growth, improve circulation of blood in the scalp, prevents dandruff and add volume to the hair. It strengthens your hair roots, gives bounciness and retains your hair color. 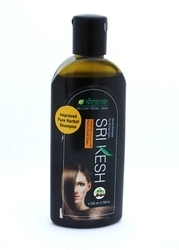 Further, it enhances hair density, increases hair length and thickness and also prevents baldness. It is 100% natural .It is completely a Herbal preparation and free from artificial coloring agents, chemicals and fragrance. 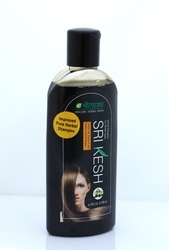 Anti-Hair fall Shampoo is for those who are suffering from hair fall due to dandruff. It targets dandruff, itching, and dryness.Strengthens and nourishes strands from the roots to help control hair fall. It strengthens your hair roots, accelerates hair growth, gives bounciness and retains your hair color. Further, it enhances hair density, increases hair length and thickness and also prevents baldness. It is 100% natural . 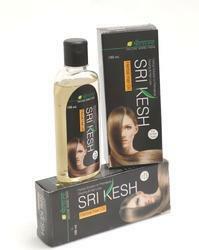 Continuous application of Srikesh Hair oil completely controls the premature graying and keeps hair black and dark. It is completely a Herbal preparation and free from artificial coloring agents, chemicals and fragrance. The oil is used for curing nervous exhaustion, depression and stress related conditions.